folded up and can hid away. So my husband being a wonderful supporter of my crazy card making won a bid on Ebay for an Anna Griffin 'gold' Bug.. I am very excited. I was mid way through this card when disaster struck and bug performed her final half effort roll. I thought it was me as the embossing folder only made a smidge of an effort. It worked out for me, I actually liked the effect and used it on this card. 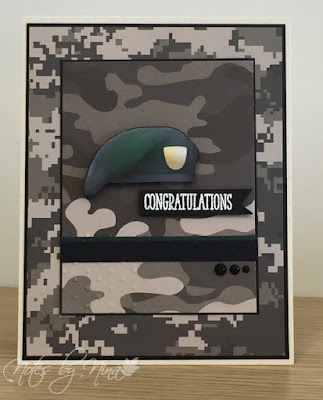 I used a couple of layers on this card, printed out and stacked clipart berets with foam tape in between. 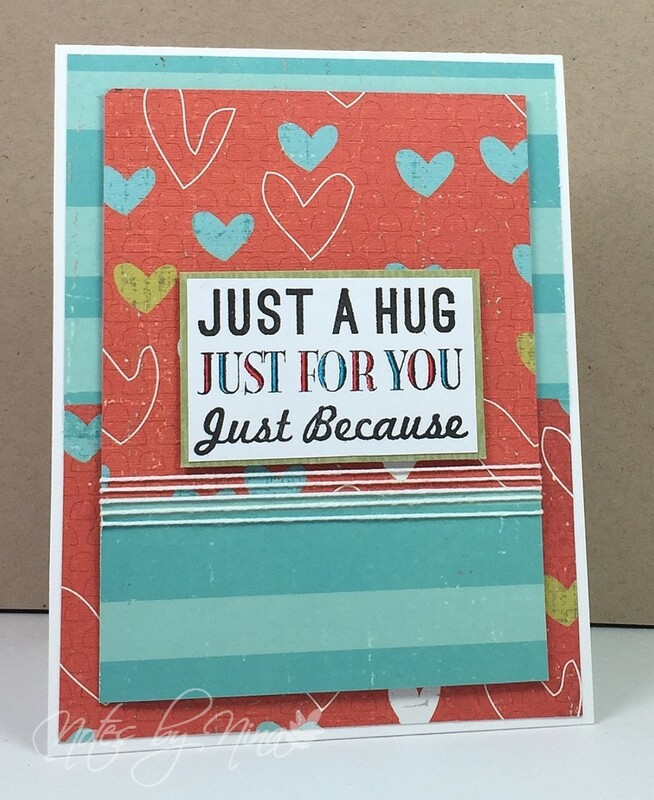 I heat embossed the sentiment and popped it up with foam tape as well. I added a strip of green and black cardstock to tie the colours in and finished with some gems. Supplies: Natural and black card stock, Designer Paper - Reminisce, Clearly Besotted - Many Tiny Messages, clipart, gems. It is a gorgeous day out the window, it is hard to believe that summer.. is almost half over :(. Spend a little time this morning with an organizing guru to get some assistance with my craft room flow. It is coming along I am very happy to say. I knew lighting was an issue and that was one of the topics. I had a coupon to a local lighting store and I found a beautiful piece to hang from the ceiling, it offers 5 60W bulbs. I can't wait to get it installed. This card is legacy from my sister visit. 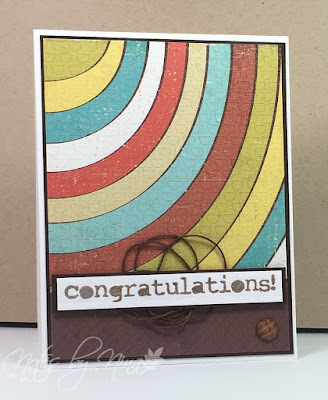 I do love the simple layout and this fun paper was perfect. I used the flipside of the paper for the bottom portion. I added some foam tape to the sentiment and put a little but of twine under it. I finished with a gem, I love these patterned gems.. they add a little something extra :). 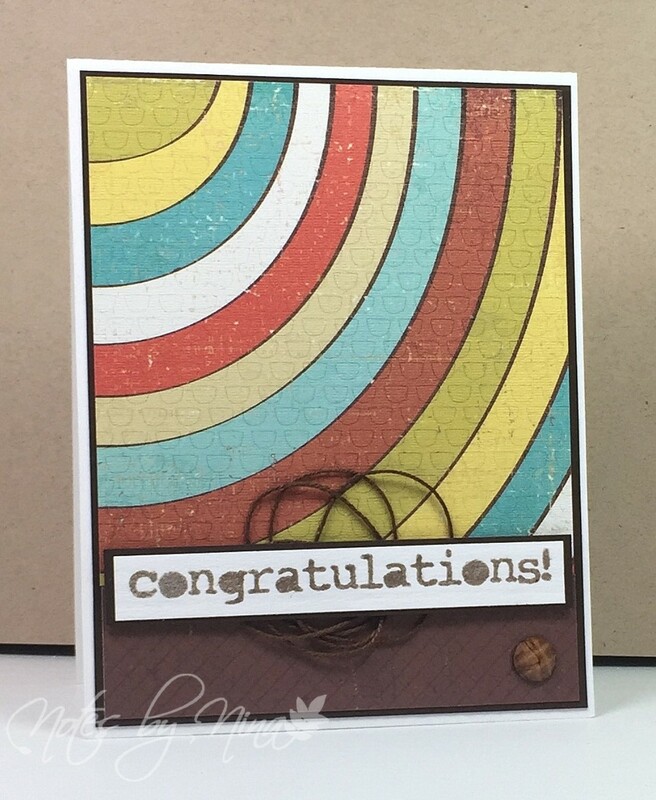 Supplies: White and brown cardstock, Designer Paper - Crate Paper, Bo Bunny - Congratulations. Happy Friday, as I post this (way to early in the morning) it is blustery with rain and the occasional clap of thunder. We rarely get thunder and lightening on the island not sure why.. will need to check with Google on that :). Another simple layout, I love the fun gears and great colours on this DP. I don't recall if my sister and I were looking at a sketch when we I was creating this card but I don't recall which one. I used matted layers and popped up the sentiment. I finished with gems. 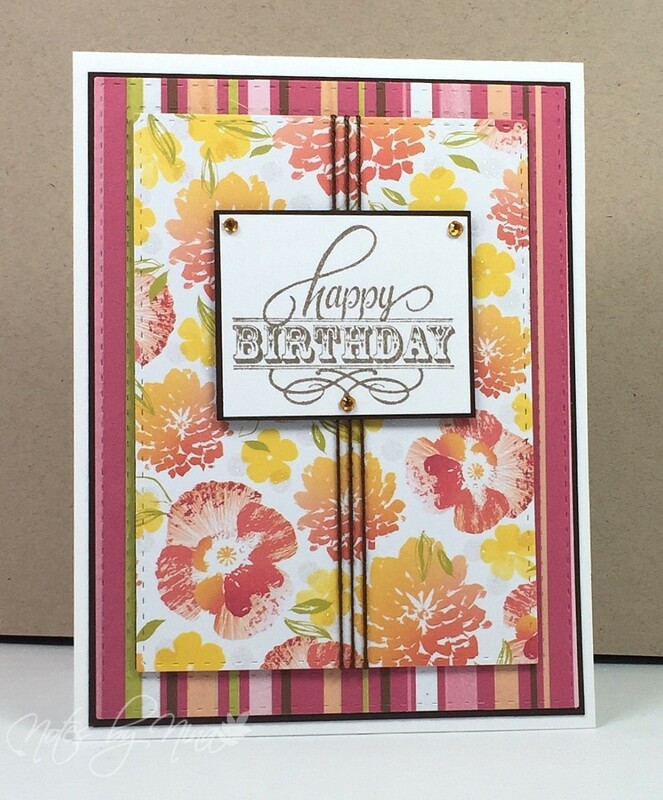 Supplies: Cream and brown card stock, Designer Paper - KaiserCraft, My Favorite Things - Birthday Greetings, gems. I love this stamp and this adorable paper. I cut two panels then cut those panels in half to reverse the print on this double sided paper. I popped the second panel up with foam tape and added some twine along the paper seam. 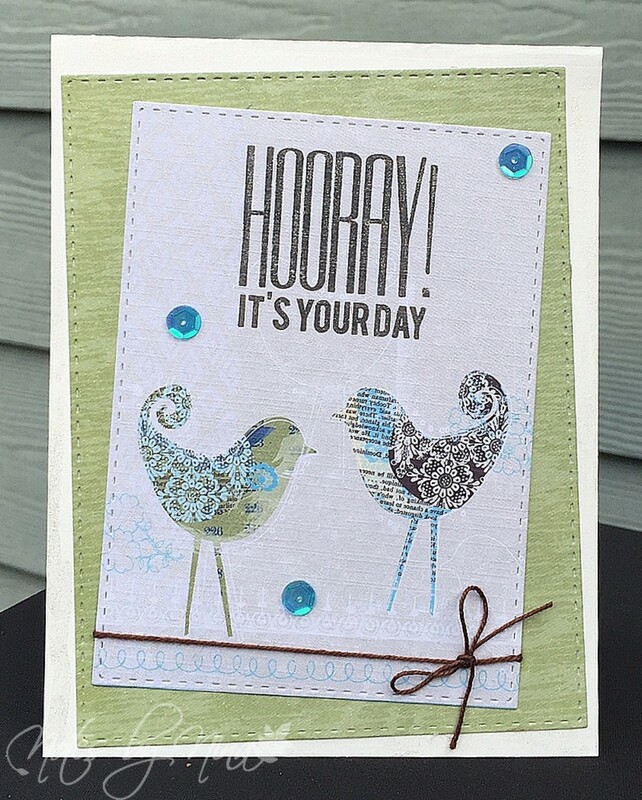 I stamped the sentiment and used markers to added matching colour. I popped the sentiment panel up with foam tape as well. Supplies: White cardstock, Hero Arts - Just a Hug, Designer Paper - Crate Paper, twine. 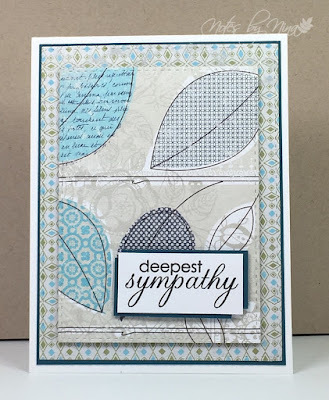 I thought this designer paper was so beautiful when I saw it, and it worked perfectly with two of the sympathy cards I created. 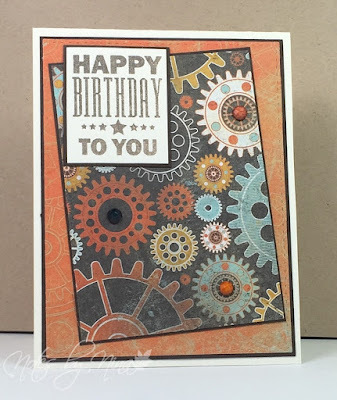 With this one, I used some new Memory Box dies that have all sorts of angles to them. It allowed me to pop up part of the bottom panel and put a piece of the other side of this double sided paper underneath. 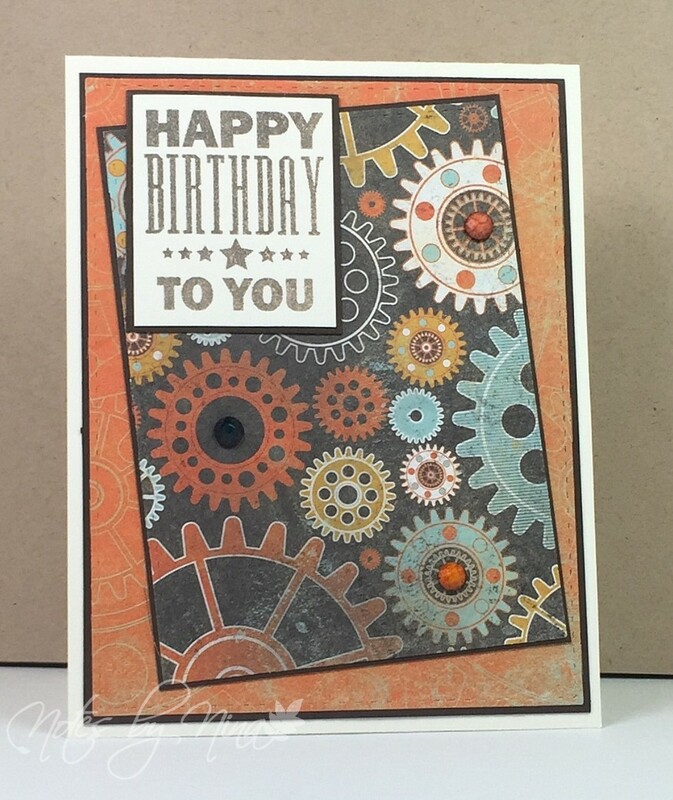 I heat embossed the sentiment and then added an offset scrap of the left over DP then popped it up with foam tape. I finished with some small black gems. Supplies: White and gray cardstock, Designer Paper - Kaiser Craft, Stampin' Up! 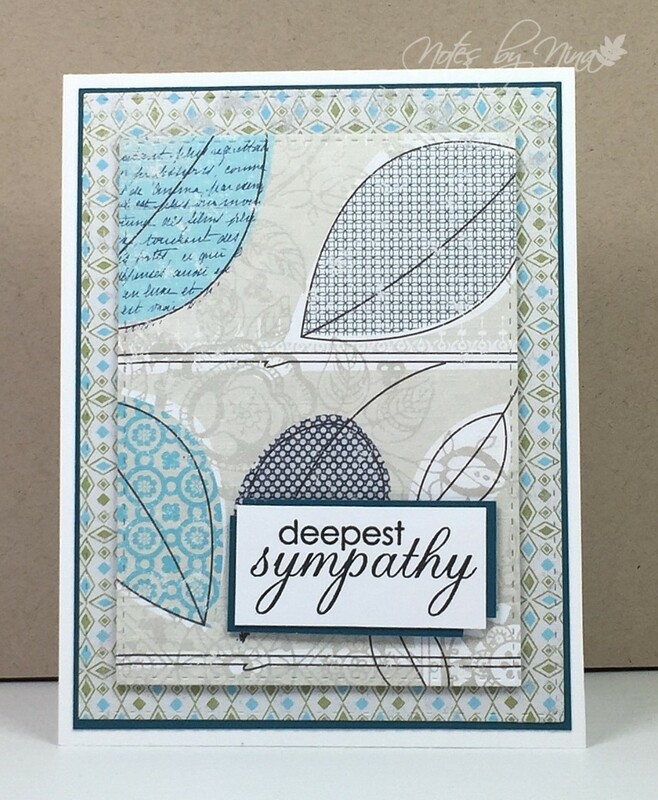 - With Sympathy, Memory Box and SSS stitched die cuts, gems. 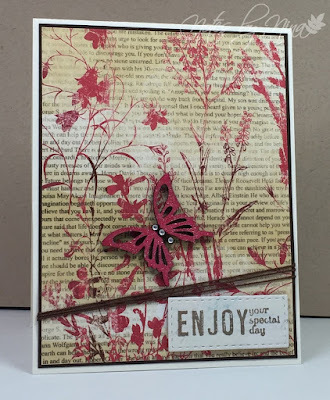 I love this vibrant paper, it worked perfectly with this wooden butterfly that I covered with Wink of Stella. I added some angular twine and then popped up the sentiment with foam tape. I added a small brown mat in behind the DP. I finished with some tiny gems for the butterflies body. 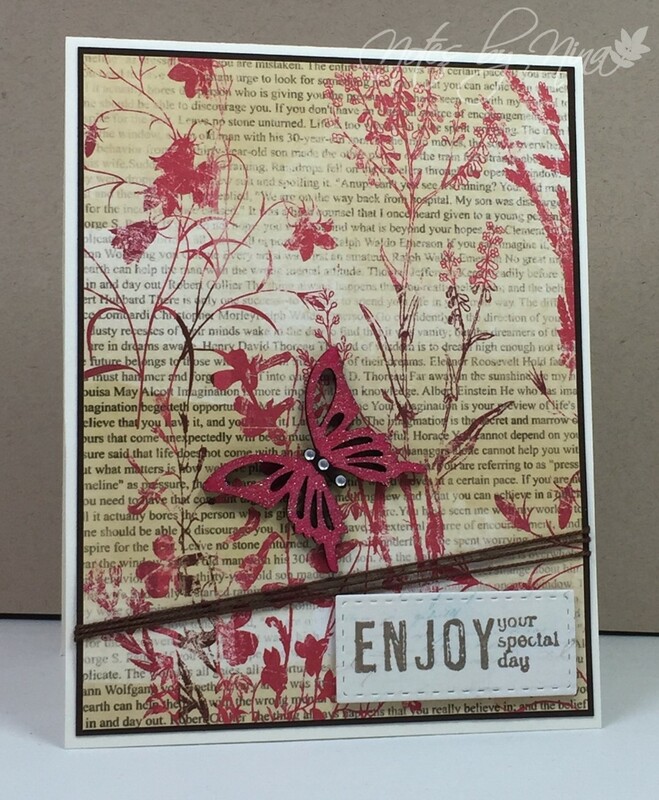 Supplies: Cream and brown cardstock, Designer Paper - Prima, Bo Bunny - Enjoy, wooden butterfly, gems and twine. I found that when I was crafting with my Sister, and away from all my familiar supplies, I like to use simple layouts. 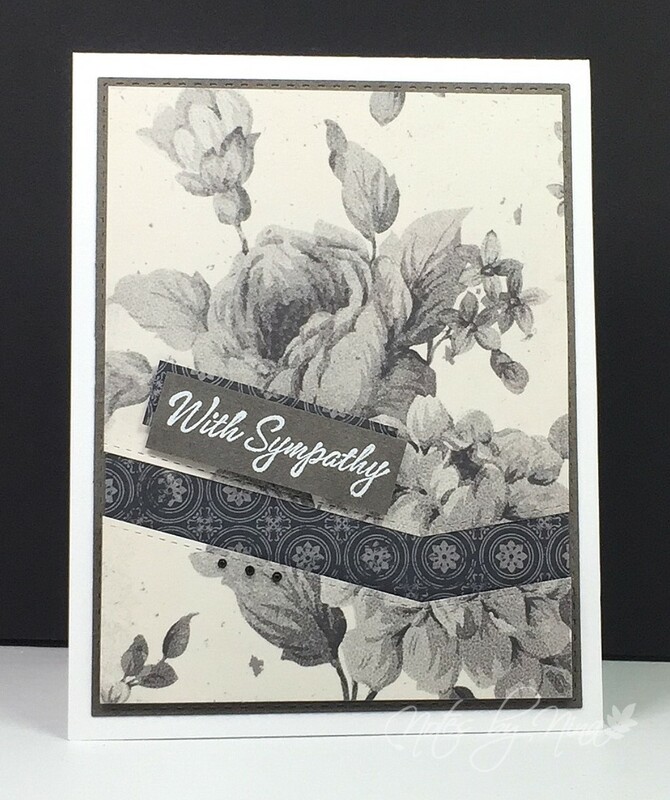 I created a series of Sympathy cards that all used simple layouts that I was quite happy with. 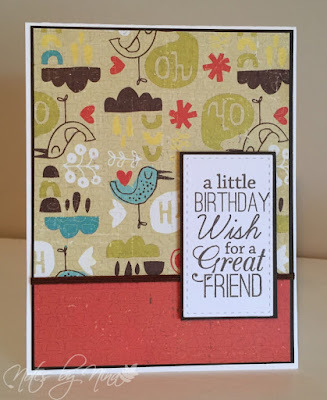 I used my stitched die cuts for this card and added a dark turquoise mat. I popped the middle panel up to showcase the pretty leaves. I added some offset cardstock to the sentiment to give it a bit more interest then popped that panel up as well. Supplies: White and turquoise cardstock, Designer Paper - Little Yellow Bicycle, Paper Smooches - Salutations. Isn't this paper pretty, I love the beautiful flowers that have the look of layered stamping. Add in the glittered dots through out the print and it adds a little something. 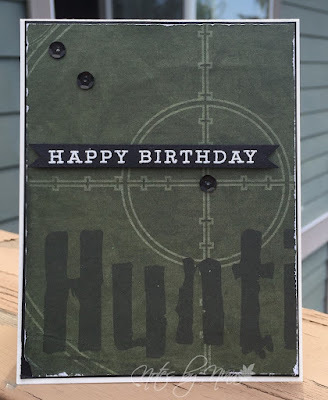 I used my stitched die cuts to created a frame, then flipped the center paper around to use the opposite side of the DP, the panel is popped up with foam. I also popped the sentiment up with foam tape, then added a little twine to run along the center of the panel. I finished with a few gems. 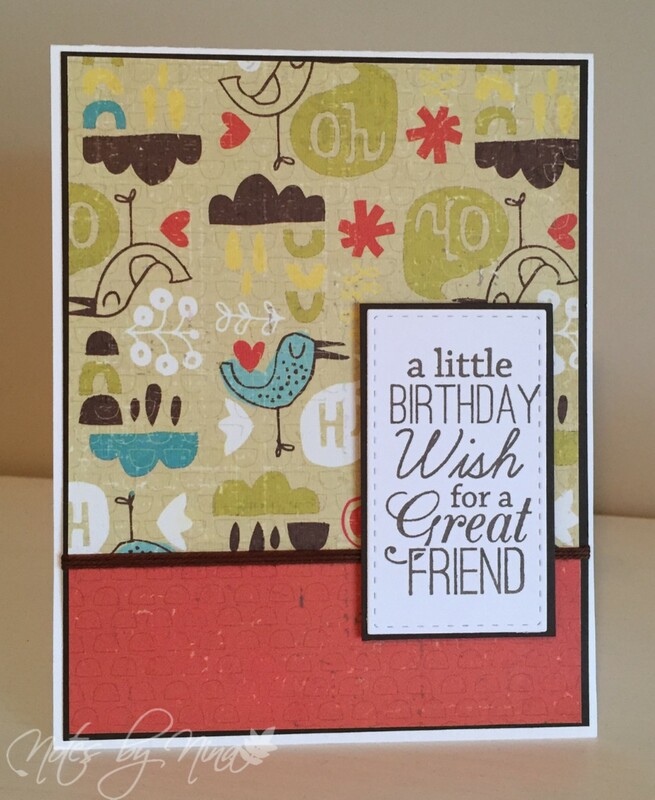 Supplies: White and brown cardstock, Designer Paper - Kaisercraft, My Favorite Things - Birthday Greetings, twine, gems. My craft room transformation is almost done, I am waiting on one more piece of furniture and then it is just down to organization. That in itself will be lots of work but will be progress made over time. I did get some crafty time today, my hubby asked for a card for a buddy. As I look at the image now it looks a little burry :(. Simple layers and little roughed up edges, I heat embossed the sentiment then popped it up with foam tape. I finished with sequins. I thought H would question those last additions but all he said was "Where did you get that paper and why did you not use it on my card.".. well, how do you answer that? I guess he liked the card :). Supplies: Cream and black cardstock, Designer Paper - Reminisce, Hero Arts - Many Everyday Messages, sequins. I took very little in the way of craft supplies to my sisters for my visit, so I relied on my sisters generosity and raided her stash. I found some cute and fun papers that allowed me to make some CAS cards. This one had these adorable little birds along the bottom, I killed the whole sheet to get these two little cuties. 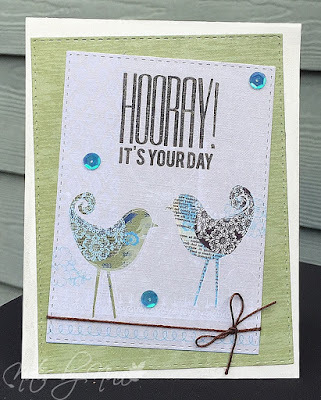 I used simple layers, I stamped the sentiment right on the DP but I sure missed my Misti to make a nice crisp stamp. I finished with some twine and sequins. Supplies: Cream cardstock, Designer Paper - Little Yellow Bicicle, My Favorite Things - Birthday Greeting, twine, sequins. My poor blog has been neglected, life has just been busy.. it makes me sad when I don't get the time in my craft space. Did I mention I am doing a craft space revamp? Well my space is becoming an actual craft room. It has been something I have been procrastinating about for a long time and I am finally making it a reality. I am very excited. I am just back from vacation, we had a week in Mexico.. so beautiful. Then I left my poor Hubby at the ferry terminal with his wheelie suitcase and zipped up for a few days with my sister. Boy did we get our craft on, I was the most creative I have been in months. My sis being the artsy one of the two of us - created these stunning artistic and creative masterpieces which I am sure she will show at her blog HERE. I will post the cards I created over the next couple of weeks. It has been so long since I have really joining in a challenge that I did not have the inside track on ;). So when I saw Freshly Made Sketches challenge I knew it was perfect for me to do a number of cards doing one of my favorite things - making the paper do all the work. I did flip the sketch though, these adorable little birds needed more of a showcase then the flip side of the paper. I added some brown twine then popped up the sentiment. Supplies: White and brown cardstock, Designer Paper - Little Yellow Bicycle, My Favorite Things - Birthday Greetings, twine.